Did you see the multiple TMZ articles about Colton? Do you think he is paying paparazzi to take pictures of him and promote him? I find it a bit odd they would care about some d-list star doing pull ups on the beach. Comment: People notified me of them. His thirst is probably running a little high right now. When Becca and Colton were talking, she told him that she would Garrett he said hi. Do you think they told him what happened or filmed that one and filmed one with Blake’s name and just put in the correct scene? Interesting theory. I don’t know. My guess would be no since it was a horribly kept secret. I follow Tia on Instagram and lately when she posts, she is wearing shirts with Colton’s Charity on it. Are they together and hiding it or is she just being a supportive friend? Hey Reality Steve! Im a huge fan hopefully to take over your job one day!!? 1) So I was watching BIP and I realized since Nick left paradise when does his relationship with Chelsea start? Does he come back on the show? They’ve seen each other at least twice post show down in FL where people have seen them. But no, he doesn’t come back. 2) Is it just me or have we seen none of David and Chelseas connection, yet they keep getting each others roses? It’s not just you. 3) Which couples do you expect to announce they’re together on After Paradise? I’d have to go over everyone, but Astrid & Kevin, and Nick & Chelsea for sure. Then again, I don’t even know what “together” means for these people. 4) Do you expect Tia and Colton to end up together like Ashley and jared? Expect it? No. But Jared and Ashley basically have set this bar where any couple on any season will have a selected amount of fans who, no matter if they broke up on the show, will always hold out hope and say, “But look how long it took Jared to come around on Ashley,” and we’ll all be worse off for it. 5) Last but not least Is Wills in contention to be the bachelor, because I feel like with. all the scandals they could use a black bachelor to boost their public image? Any chance you might illuminate your fans about how “The Proposal” is filmed ( is it over a day or couple of days and compressed into 47 minutes?0 and whether there is any followup on the couples? Comment: They filmed multiple episodes in the same day and it was filmed back in April and May. It’s a joke. Hi Steve – Just wanted to say how much I love reading your comments, columns and podcasts. I wish you a lot of luck with Luca. She really looks adorable. I wanted to bring up a point about Ben Higgins. After he finished his season of The Bachelor, he seemed to want to go into politics and had his name in the running in Denver. From what I read, the bachelor/bachelorette world put a stop to it. Perhaps he still was under contract and they did not want someone to be political. This has never been addressed again. He seems to be in tight with Chris Harrison and the entire franchise. My question is did they promise him something to give this up.? Maybe that is why they consistently utilize him every chance they can get. I cannot imaging that he was happy about not be able to get into politics but I never heard his side of it. Comment: Not really. I know nothing about that. Did you see Becca and JoJo’s interviews with OK! Magazine? They were talking about how Becca snuck a phone onto Ben’s season and how JoJo snuck an iPad AND phone onto her season of the bachelorette to keep in contact with Becca. Long story short her iPad got taken up and she said she was scared to ever use the phone and Becca replied with, “Yeah I was so pissed because I wanted you to tell me how you were liking the guys and where y’all were at but I never got anything so I had to follow Reality Steve to know where y’all were at!” I just thought that was funny! Didn’t see that, but good to know they’re paying attention and following along. Or at least Becca Tilley was. In following that, I wonder if JoJo ever used the phone to look Jordon or Robby up? Another question I had is that, I know Elan Gale is really close with pretty much everyone from the franchise but I noticed that he doesn’t follow Garrett? I know he has made it known he’s left and considering the scandal, I wonder if Elan still doesn’t like him? I noticed he never offered up any congratulatory posts for them, but he has for every other season before theirs? (Besides Arie and Lauren) and he actually doesn’t follow Lauren either! Any thoughts on this? That’s pretty much it! Both of these questions prove I’ve got way to much time on my hands! But thanks again for your dedication to making this site good! Comment: Yeah, I have no idea on that one. As mentioned earlier, I don’t pay attention or really care who follows who in this franchise. Congrats on finally getting new dog. (It’s been 7 months for me and I’m still not ready, so hearing you finally were gives me hope for the future). My q is- did she come with the name Luka or did you pick that out? Comment: That was the name the Humane Society gave her when they rescued her from a backyard Oklahoma breeder where she was living in a dirt pen. Her name when they found her was Birdie. How realistic are Colton’s chances of being the Bachelor? I ask because I am a bit tired of his and Tia’s relationship drama. Plus, I think that Colton will just use the show to promote himself. I have a past-season question that I’m hoping your expertise can help answer. Who was the woman whose dad died but whoever the guy of interest was had met her dad like a thousand years ago so she was fixated that he had to be her guy because he “had her dad’s blessing?” I tried googling around but all I found was someone from Arie’s season, and I feel like it was someone else. Do you know of anyone else who had that scenario? Comment: No, you were on the right track. It was Jessica Carroll from Arie’s season. I can’t remember if you’re doing reader emails during paradise, but I wanted to see if you noticed that during tonight’s episode while Tia and Colton were on their date and David was at the bar talking to Wells and Yuki, you can clearly see Kenny talking to Benoit behind David. They hadn’t shown his arrival in paradise yet. I’m sure they don’t show events in the order they happen all of the time, but I just thought that it was really poor editing because it wasn’t hard to miss. Comment: I didn’t notice it at the time, but you’re one of many who sent it to me. Chalk it up to another bad editing job in continuity. Happens all the time every season. I stumbled on Josh Murray’s new podcast and it was all… very weird. In it he mentions on his season that the producers told Andi she was falling for their “next bachelor” and that they even talked to his family about it during his hometown, and I think he even said they were trying to get him to leave her on the show so he could be the bachelor but “he didn’t want to hurt her” and wasn’t a guy like that. Any idea if that’s true or if they actually talk to contestants about being the bachelor while they are still dating the lead on their show? I heard that particular story after Andi’s season was done filming, so I’m not too surprised. Whether or not they’ve done it on other seasons, I don’t have any specific examples, but can’t say I would be surprised if they did. Second question about BIP, you had a picture of Chelsea and Nick post show, but they never really showed they liked each other on the show and he went home the first ring ceremony? Also I think they didn’t have any ITM of him leaving and thought that was weird, did they just decide to get together post show and do you know if they are still kind of dating? Just curious. Comment: They were together last weekend in FL again, so, it certainly looks like something is going on considering she’s left her son in Maine twice now in the past month to meet up with the guy down in FL. I don’t think you do that for someone that’s just a platonic friend. Send all links and emails to: steve@realitysteve.com. To follow me on Twitter, it’s: www.twitter.com/RealitySteve. Instagram name is “RealitySteve,” join my Reality Steve Facebook Fan Page, or listen to all my podcasts at Apple Podcasts. Talk to you tomorrow. Am I just imagining things, but is this season deeper in the gutter than other seasons? The Tia/Colton relationship has been crammed down our throats and every comment I see on Twitter is about how sick people are of seeing them and not other people. And the shady characters seem to be prominent this time, unless I’ve just forgotten other seasons. On the other hand, as much as I disliked Jordan on Becca’s season, I found him to be fun to watch last night. Maybe that was because nothing else was entertaining. Actually the funniest part of the whole show was when my husband walked in after the Jenna and “Ben Wa” makeout session and he wanted to know what was wrong with the guy because the bottom half of his face was so red. I too thought Jordan was funny, until he was not. His humor is always at someone else’s expense; he lashed out at innocent people when angry; he hit below the belt; he’s petty and viscous; insecure; and jealous, both of which are not good qualities. So, yeah I’m pretty much over the Jordan show now. Interesting that Kendall and Leo had something going before the show. I couldn’t believe how Leo told her he’d be upset if she kissed someone else, after sucking face with Chelsea a few minutes after sucking face with her. What a douche with a double standard too. Pissed they didn’t keep Bibi there, since they used her to keep Colton around for their lame story line with Tia. Also, I believe Colton cares for Tia, he just cares for being the bachelor more. The entire Jorge photo shoot and Ben, Amanda, Arie, Lauren fiasco was a groaner. WTF? Why did they even bother with that, I don’t get it at all. How in anyway did that enhance the show or move the narrative forward? I think the initial concept of BIP was a fun one. However, even in the first series didn’t AshLee F stalk Graham B on SM? Maybe even had contact with him before filming? All that beforehand contact has gradually got worse as the years wore on. It’s got tackier and sillier since series 3 and completely lost the plot last year….with that scandal. 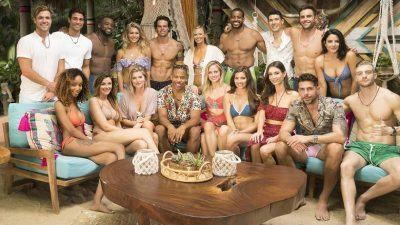 I agree it all seems so contrived now and even at the start of this years series, didn’t Chris Harrison say to them all how BIP does work because of Tanner and Jade and Evan and Carly? It seems a big sell for them to aim for an engagement. I think most viewers are okay with some contrived and manufactured drama, but if it comes across as 100% fake and contrived and just a downright slutfest, it won’t wash (with the viewers) and the franchise is on an even slipperier slop then we thought. I’m not sure what RS is alluding to with Kevin though. With Jordan, there is a possibility that he’s hamming it up for the cameras, I wouldn’t put it past him. Not a great excuse or good look though regardless. Tinyred, I too didn’t understand the Kevin comment. I like Bibi because she seems real, unlike most of them. I think it’s very possible that Colton has not come to terms with his sexual identity, thus the virginity and thus the lackluster pursuit of women/Tia. I do not see for the life of me the attraction of Leo. Even putting aside his skeezy past, he’s just gross to me. over the place, there could be an underlying reason or he could just not be as stable as he should be. Overall, I just feel he has a lot of maturing to do. Bibi is down to earth I totally agree, I just didn’t like her edit on The Bachelor. I’m an episode behind on BIP, and I’ve re-evaluated my opinion of her, her and Kendall are the best out of the girls so far. Whiny AND entitled is never a good combo. Not sure where you got this information from but the idea that Kendall and Leo dated before BIP is completely false. Your sources aren’t very reliable if that’s what you’ve been told. They followed each other on Instagram but they never dated or came anything close to that.